For many anglers, bluegill fishing can be extremely frustrating because many lakes and ponds are so overpopulated with small and medium-sized bluegills it is nearly impossible to find big ones. Finding big bluegills takes some effort, but once you learn how to find them, you will be enjoying some of the best bluegill fishing of your life. If you want to catch large bluegills here are some tips to get you started. If you want to catch big largemouth bass or monster northern pike, you do not just plop your boat into any body of water that holds these species of fish. Right? You do your research and identify what lakes are likely to hold the big ones. The same is true for bluegills. The biggest mistake those chasing big bluegills often make is to go to their nearest lake and to start fishing, hoping to catch a mammoth bluegill. This is likely to end in disappointment, because so many lakes have high populations of bluegill. The better choice is to research lakes and find ones that are more likely holding big bluegills. The most important factor in finding lakes with large bluegills is to look for bodies of water that have low populations of bluegills. Because there are few bluegills, there is less competition for food, so those that are present are able to grow larger. One of the best ways to research this is to check state fisheries department creel or netting surveys. They will provide valuable information on how many fish and the size of those fish, were sampled by fisheries personnel. You can also ask for information at local bait stores. However, do not ask what lakes are great for bluegill fishing. Instead, ask what lakes have very few bluegills. Big bluegills are likely to live in deeper water than small bluegills, and many times they will be loners. If you find an area holding small fish, go deeper, get away from the schools. Do not be afraid to go to 20 feet or deeper to find the big ones. Look for submerged cover, such as fallen trees, rock piles or weed lines. Big sunfish will likely be holding in these areas. It is often true that bigger baits catch bigger fish. This can be true with large bluegills. Use a larger offering than you would typically use when bluegill fishing. Some of the best baits include a large glob of worms or night crawlers, leeches, minnows or even grasshoppers or crickets. Even lakes with high populations of bluegills are likely to hold some big bluegills. However, they are tougher to catch, because there are so many small and medium bluegills. One way to avoid the small bluegills and catch large ones is to fly fish. 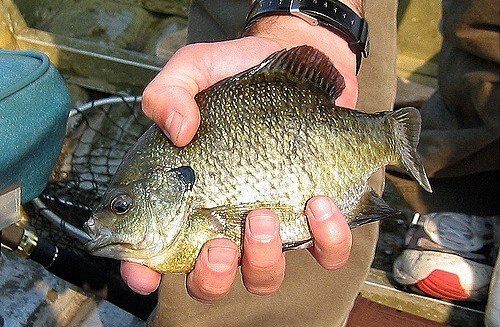 A medium-size popper can be too large for small sunfish to inhale. They will try and try, but they typically cannot take it. All that activity will draw attention and if there is a big bluegill around, it will likely move in and take a shot at the popper. This is a productive way to weed out the small fish, to get to the big ones.